I love the vintage 20" Dollikin dolls made by Uneeda doll company in 1958 so tried to find an example of each variation for my collection. The original Dollikin dolls are 20" tall and jointed in 16 places, wrist, elbow, upper arm, arms, neck, waist, legs, knees and ankles. The bodies are hard plastic and the heads are a vinyl with rooted hair. Fingernails and toenails are painted red. The dolls come in a variety of hair colors and styles. Some have a short "bobbed" style, some have a severe bun, with and without a widows peak. Some have a youthful ponytail with bangs. Hair colors range from light blonde to reddish blonde to brunette and jet black. Eye colors vary from blue to grey, green and an unusual reddish brown. Sometimes the eyes are painted with heavy black "Cleopatra" type eye liner on the edges. All have sleep eyes with hair lashes. Some dolls have peach lips, some have deep red. 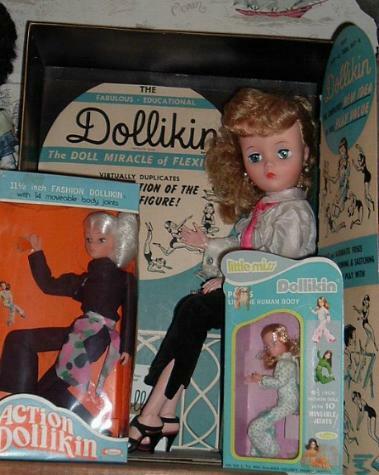 I also have a few of the 11 1/2" Dollikins from the late 1960's and the Dawn-size 6 1/2" Little Miss Dollikin from the 1970's. This is another mint in box Dollikin in the later version of the box. The box is smaller with a cello window rather than a closed gold lid. This doll wears the plaid slacks set in the red print. This outfit also came in green plaid. Two Dollikin dolls in the original Lotus Blossom outfit. The blonde is my childhood Dollikin from 1958. Elastic strap shoes are original to the doll, the other shoes are not. A Dollikin in the original version of the ballerina outfit, a cream colored tutu and leotard. I added the rhinestone crown. Two versions of the Uneeda cordoroy slacks. These came in red or yellow with a cream colored, fur collar sweater. The slacks have the trademark Uneeda slit at the ankles and have brik brak detail down the sides. They snap in back with a large donut snap, another key element to determining if an outfit is made by Uneeda. This Dollikin is dressed in a skating type outfit, which may not be original to the Dollikin dolls. I have seen this outfit on a Uneeda 19" fashion doll in a vintage catalog, so it is a Uneeda outfit. My three versions of the brunette widows peak hairstyle dolls. The hair was rooted differently in each doll, some had a very slight widows peak and others very deep. Two versions of the plaid pants set, red and green. Both outfits come with the same cream colored blouse and both vests have the solid red felt back, but the fabric is a green plaid on one and a vivid red plaid on the other. Other than slacks and blouses, Dollikin also came dressed in a jumpsuit with floral print in either red or blue, as shown. Usually these dolls were the Mommy Dollikin and Baby version. My Miss Twist doll in a replica of her original outfit done in red. The original Miss Twist outfit was a cream colored fringed cocktail dress. I decided to sew a replica but make it red instead. She wears Cissy shoes. A picture of me in 1958 with my new Dollikin that I got for Christmas! 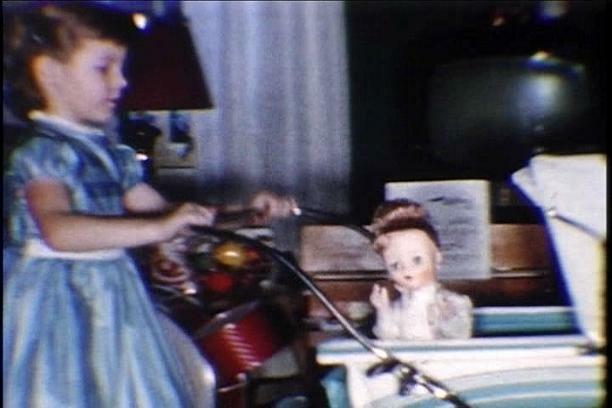 This photo came from an old 8mm home movie film so it is not very clear, but it is fun to see me and my brand new Dollikin when I got her for Christmas.